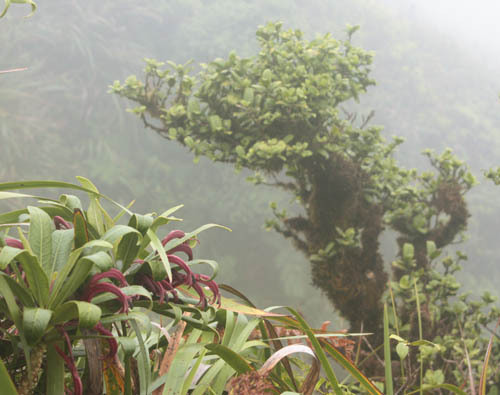 I hiked to the Koolau Summit Ridge on the Manana Trail to see the native plants and flowers that live in the mountains above Pu’uloa (Pearl Harbor). 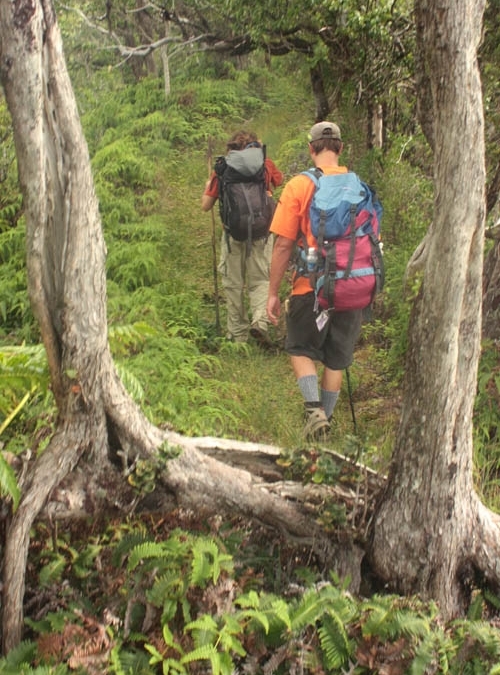 The Manana Trail starts the end of Komo Mai Drive above Pacific Palisades and gains some 1,700 feet over a distance of 6 miles to reach the summit. 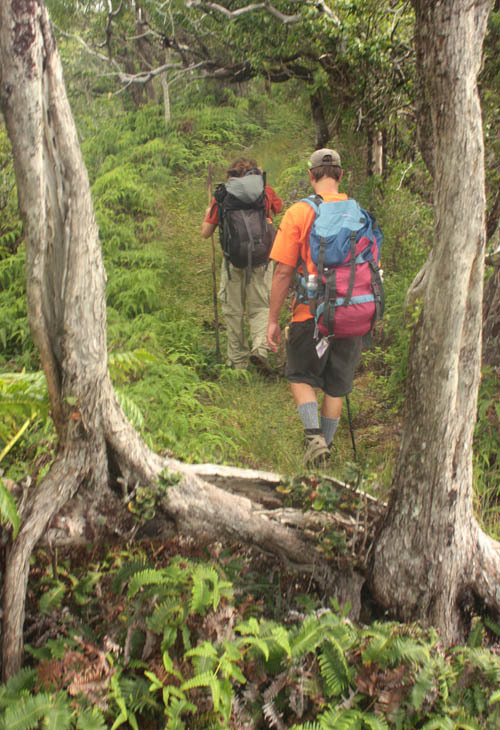 The trail is tough — it follows the outline of the ridge and forces hikers to climb up and down dozens of pu’u (hills) in both directions over the 12-mile round trip. August Smith and Nikolaj Nordkvist hike through a pair of ohia lehua trees (Metrosideros polymorpha) conjoined at the roots. Uluhe ferns (Dicranopteris linearis) thrive at the base of the trees and along the margins of the trail. 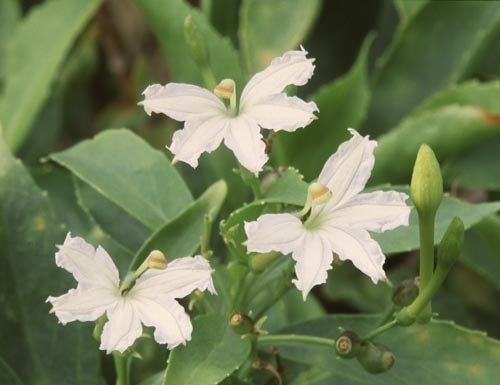 Not far beyond the Boy Scout shelter, we saw the fragrant half-flowers of naupaka kuahiwi or mountain naupaka (Scaevola gaudichaudiana) about three-quarters of an inch across. While these endemic flowers are by no means incomplete, their petals are situated on only one side giving them the appearance of being only half-a-flower. 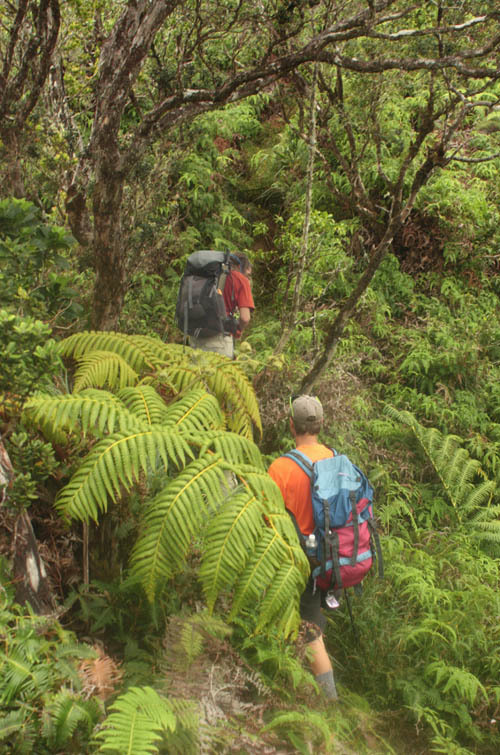 While climbing up and down the many hills, we passed numerous hapuu tree ferns (Cibotium sp.) which have large fronds almost 5 feet long. The higher we climbed the more native the landscape became. 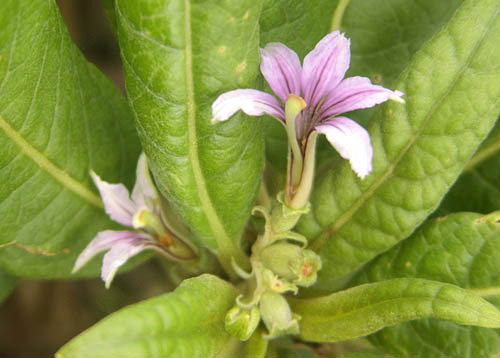 We stopped at several points along the trail to admire the flowers of purple naupaka kuahiwi (Scaevola mollis) which are even more fragrant than their white counterparts. 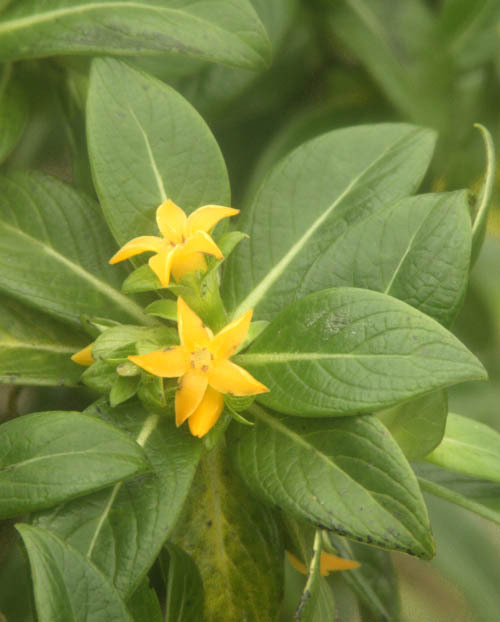 One of our more unusual finds were the yellow flowers of kamakahala (Labordia hedyosmifolia) about three quarters of an inch in diameter. While these flowers appear to be soft and delicate they are actually hard and stiff to the touch. 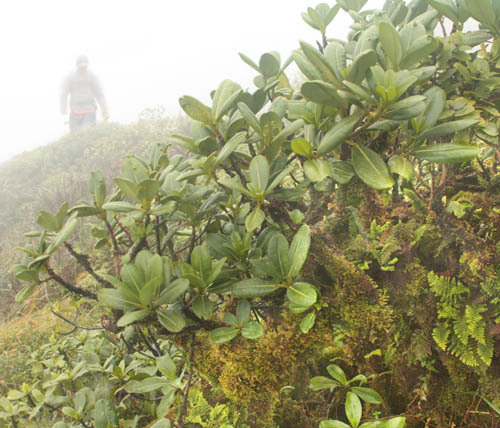 When we neared the summit, clouds descended and shrouded the landscape in a gentle mist. 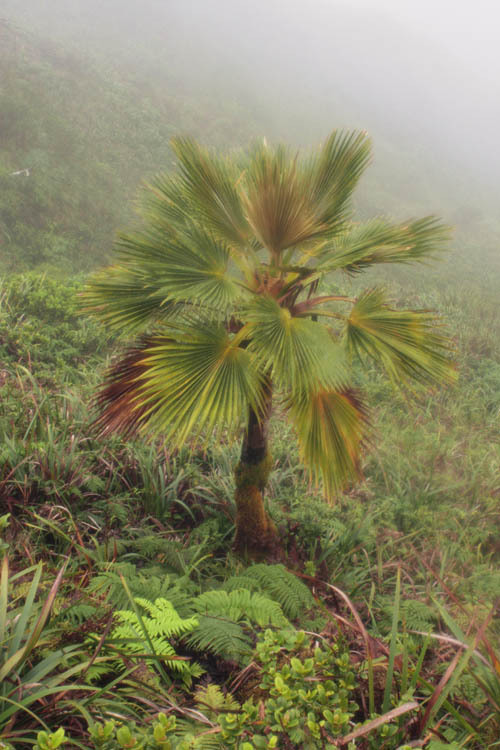 Loulu palms (Pritchardia martii), which are endemic to the Koolau Mountains, become much more common the closer one gets to the summit. 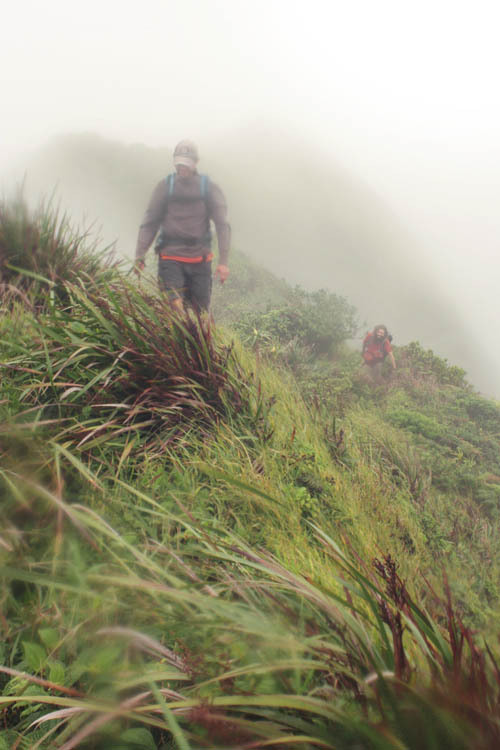 When we reached the summit, clouds completely block our view of the windard coast of Oahu. Since there was lots of time to explore, we turned right towards Waimano to examine the native plants that live along the summit ridge. I love to see the moss covered shrubs that live along the very edge of the mountains, like this endemic alani (Melicope clusiifolia) covered in a profuse growth of epiphytic mosses and ferns. While making our way along the summit ridge, the wind howled and clouds dumped their moisture on us several times. Since we were cold and ill-equipped to handle the elements, we opted to turn around to explore the plants further down the Manana Trail instead. While making our way through the clouds, we were thrilled to see on an endangered haha (Cyanea koolauensis) in full bloom next to a manono (Hedyotis sp.) covered with brown moss. 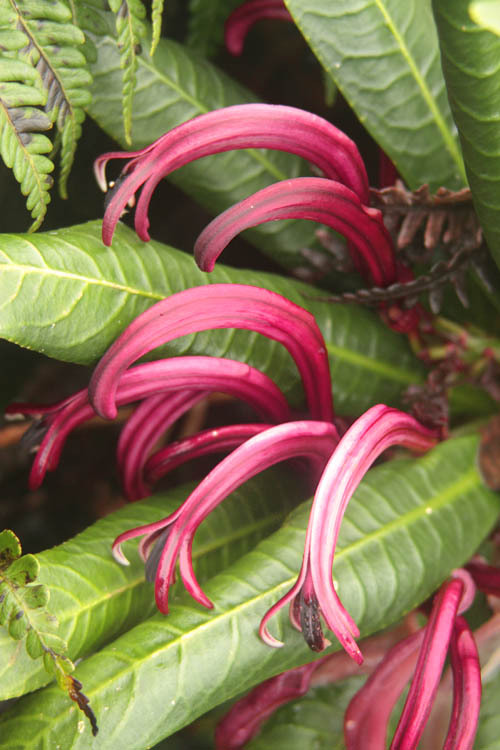 The pink-purple flowers of haha were about 3 inches long with a most distinctive curve. It would be neat to know what kind of bird or insect pollenated these flowers. It would need an especially curious beak or proboscis to reach the nectar at the base of the flower. 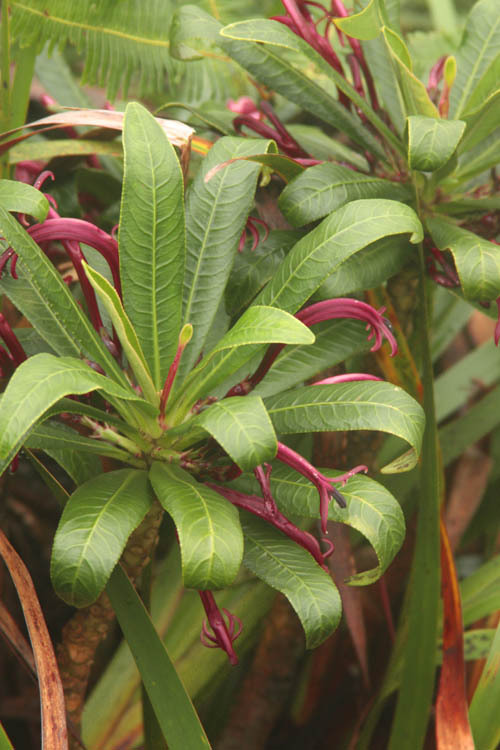 Cyaneas are in the Hawaiian Lobelioid family which are endemic to Hawaii and found no where else in the world. It is believed that the 125 species of lobeiloids, which are grouped into 6 genera, evolved from a single introduction to the Hawaiian Islands 13 million years ago when Gardner Pinnacles and French Frigate Shoals — now mere coral atolls in the Northwest Hawaiian Islands — were high islands and long before the current main islands existed. Rain fell on us once again and it was time for us to return the way we had come. As we climbed up and down each hill on our way back down Manana Ridge, I reflected on our great fortune seeing this dazzling array of native flowers. There is always something amazing to see on the Manana Trail. What a great place to hike!